Ever wanted to buy a fighter plane? Well, now's your chance. Introduced by the RAF in 1969, the Harrier jump jet was the first plane in the world to take off and land vertically. It is considered to be one of Britain's greatest technological achievements. But the Coalition Government announced in October that they are to scrap the RAF's Harrier fleet to save money. 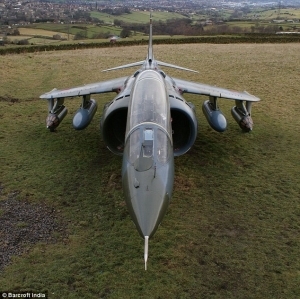 However, a 1971 Harrier jet, which was decommisioned in 1997, is now yours to buy on eBay for £69,999 (C$111,456). The jet was rescued from the scrapyard by an aircraft restoration company. Current owner Chris Wilson, 33, from Bradford, West Yorkshire, who served as a mechanic in the RAF, said it would be possible to make the Harrier air-worthy. It has been stripped of its Rolls Royce engine but Mr Wilson said one can be sourced. The Harrier played a crucial role in the UK winning back the Falklands after they were invaded by Argentina in 1982. It shot down 25 enemy aircraft without a single loss in air-to-air combat.